Did you catch the premiere of Ghost Stalkers? 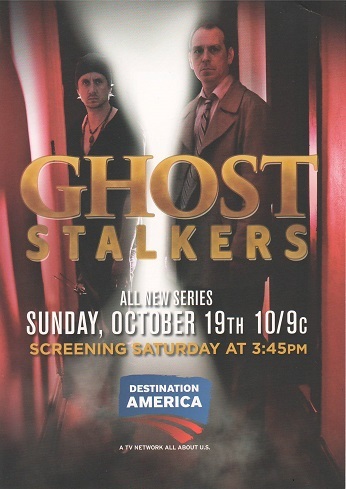 Produced by Ghost Adventurer’s Nick Groff, Ghost Stalkers follows John E.L. Tenney and Chad Lindberg as they investigate 6 under-hyped locations. The API Gals watched and will review the show this week on Archer Paranormal Radio. Tune in and call in 619-639-4606 this Thursday, October 23rd at 7 pm EST on http://www.liveparanormal.com. Missed it? Check out the clip: http://www.destinationamerica.com/tv-shows/ghost-stalkers. Sorry you thought it was dull. It happens. There are some shows I can’t get through. At least you tried. I reply liked ghost stalkers. I hope it continues and picked up for another season. Still awaiting word. John Tenney has announced his lecture series dates. Hope that is not an indication that GS wasn’t renewed. I think the show could be good – if they replace Chad. He cries on every episode; he is no ghost hunter. He is such a wimp. I think Chad’s reactions are part of the dynamic. However, he may have settled into the groove by now. I LOVE Chad. And Nick – everything must find it’s groove. I hope they continue. I watched Ghost Adventures for Nick only. When I found out he left – I followed him. Good luck to him and Chad and I will be watching for a new season!